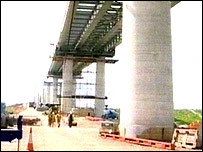 A new multi-million pound bridge that will allow motorists to travel between the Isle of Sheppey and mainland Kent without interruption is taking shape. The new Swale bridge is at the halfway stage as engineers continue to move the 2,380 tonnes of concrete into place. 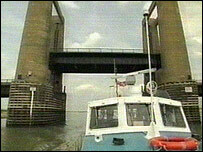 At present the old Kingsferry bridge is raised regulary to allow large ships to pass along the River Swale, causing traffic chaos in the area. But congestion should ease when the 35m (115ft) high bridge opens next year. Consultant engineer Paul O'Connell from the Highways Agency said he was confident the project would be completed on time but said moving each section of bridge into place is a slow process. "If you stand watching it you won't see anything because it takes six minutes to go one metre (3.28ft) ," he said. Each section of bridge is being moved into place using two hydraulic jacks and metal cables. At the moment the island is cut off from the mainland every time the old bridge is raised. But the £100m scheme will see a state-of-the-art structure built to carry four lanes of traffic. The government hope the new bridge will drastically improve the local economy. The Isle of Sheppey, which measures approximately nine miles by four miles, lies off the north Kent coast near Whitstable.